I'm one of the lucky few owners of one of his original one of a kind paintings and I am delighted to enjoy it. Painting tecnique by mastering colors reaches to tremble inside yourself, becoming his artwork superb. I am extremely satisfied with customer service and communication provided also. The only thing I can say is many thanks to Mr. Leonid and Boris Afremov. 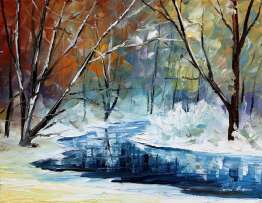 I purchased 2 different works of art from Leonid Afremov. I am in awe of his art work daily. When the sun rises at my home, I can see it in his Landscape piece on my wall. Then again when the sun is setting outside my home, his landscape does the same. Somehow, the painting matches the synergy and liveliness of the outdoors each day. I am a proud owner of his art and so fortunate to have come across him and his work. Thank you, Leonid!